Glancing around the crowded Old Courtroom just before the lights went down, I really didn't predict a riot. I knew - we all knew - that we were there to recreate the Old Price protests of 1809, when an angry public shut down the Covent Garden Theatre for an astonishing 66 days. But would the tweed-clad gentleman in front of me really raise his voice? Could that arty lady in rectangular spectacles bring herself to join a mob? Maybe, just maybe, they'd do it on the street - but never in the sanctity of a theatre. We listened politely as the play's two advocates set out their cases. Like wise owls, we nodded at the telling parallels to the present day. And then it happened: a shout here, a hiss there, a sudden explosion of noise. We stamped, we bellowed, we sang cheerfully anachronistic protest songs. It's good-tempered, it gets the blood pumping, it's marvellously liberating... and poor old John Kemble, theatre proprietor and most famous actor of his day, is caught at the centre of it all. There's a certain naughty frisson to all this, since lead actor George Dillon is Brighton's own Kemble: shouting him down in his home city is like booing Simon Callow himself off the stage. But Dillon's a good sport about it all, manfully hamming up his early scenes and deriding us, his hated audience, as soon as he thinks our backs might be turned. I started to fear, not that it would flop, but that the whole thing would run out of control. But they're onto that too: Steve North, playing rabble-rouser-in-chief Henry Clifford, has the natural authority both to start a rumpus and to quiet one down. In case we don't get his gestured hints, the simple expedient of raising the house lights gives a clear signal when it's our turn, and the audience (in the main) slipped into and out of the mob mentality according to the demands of the plot. There are a few imperfections. The prelude felt over-long (we were there for a riot, not for Macbeth); some of the exposition was a little heavy-handed, and the key points of the plot were reiterated once too often for my taste. But never mind all that - there's a serious narrative alongside the swagger, and the script plays emotional tricks which, though hardly subtle, are masterful all the same. Towards the end, as a broken Kemble rants inside his besieged mansion, I felt the pangs of repentance; and when Clifford incited us to a final act of humiliation, I found I couldn't join in. This is a man who, in a fittingly Shakespearean tragedy, has allowed preening ambition to destroy that which he holds most dear. But the moment passed. 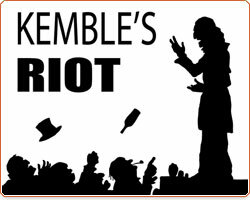 With one last petulant monologue, Kemble reverted to what he was - a pantomime villain soaking up our pantomime boos, in a play which, for all its erudite veneer, was undisguisably a pantomime too. So can I *really* five-star a panto? Of course I can. Book early.